The 3rd generation of Geo Metro was introduced in 1995 on the third generation of the Suzuki Cultus platform...but today's custom Metro looks more like a 1994 (or earlier) second generation Cultus, or at least what is left of it. Find this 1995 Geo Metro offered for $1500 in Orlando, FL via craigslist. When I first saw this listing, I assumed it must be a scammer, because the photo doesn't really match the description. 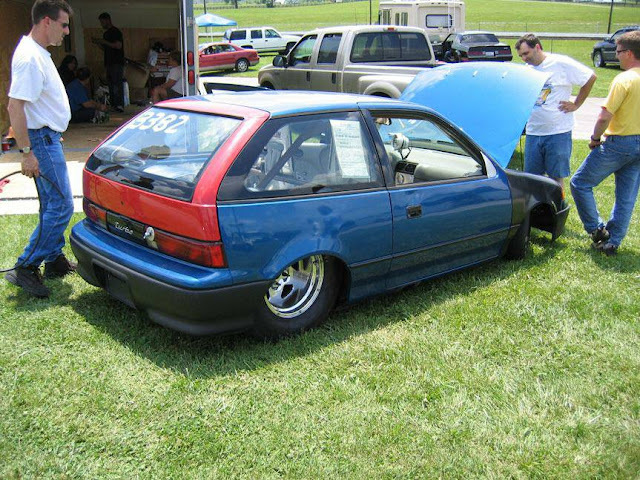 The caged thing looks like it has been converted to rear-wheel-drive (big tubbed rear end), but the seller only mentions a Garrett turbo, dry fog nitrous injection, and claims an 11 second 1/4 mile...which you could in theory reach with a drag slicks on a front-drive metro. Bottom line, you'll either die on the ride home in your $1500 Metro, or you'll be slowly tortured and eaten by some cannibal who is really good at making tempting craigslist adverts to get his victims. So his new project car is a 98 Malibu. Dude must like his sleepers in a permanent coma. This would make a terrific Electric Vehicle conversion! Looks like a turbo to me, but doesn't look like a $1500 car at all. Nice find, Anonymous. That CL ad, at $1500 is starting to sound more and like a scam. "and still gets me from point A to point B at 38 MPG"
Sounds like a prank call setup to me.